English Heritage became a charity on 1st April 2015 known as the English Heritage Trust which cares for sites held in guardianship for the nation. The charity is licensed by Department of Culture Media and Sport to conserve over 400 historic sites and their collections for the benefit of this and future generations. Stonehenge is the best-known prehistoric monument in the care of English Heritage (EH). It receives over one million visitors per year from all around the world. In use between around 3,000 BC and 1,600 BC, the Stonehenge monument was constructed and reconstructed over a period of more than 1,000 years, culminating in what the World Heritage Committee has described as the most architecturally sophisticated prehistoric stone circle in the world. The site was given to the nation in 1918, and is managed by English Heritage. However – due to the proximity of two main roads, and the poor quality of ageing visitor facilities – the experience of visiting this major British attraction was often a disappointing one. People who were expecting to see one of the wonders of the world left feeling disappointed at the poor quality of their experience, and the minimal interpretation. In addition, the site was severely compromised by nearby roads: the A303, and the even closer A344, which ran so near to the Stones it almost touched the Heel Stone, and whose construction had cut through the ancient Avenue linking the stone circle to the River Avon. This precious ancient landscape – and visitors’ appreciation of it – was compromised by both traffic noise, and the visual clutter of the old visitor facilities, in the form of 1960s prefabs attached to the car park. It was difficult to get a sense of this spectacular site in its natural setting. By careful and lengthy negotiation with landowners and those with a stake in the surrounding area, major improvements have now been made. Through the Stonehenge Environmental Improvement Project (SEIP) English Heritage has delivered a step-change in the way Stonehenge is presented and how people experience it. The Project was led by English Heritage and developed through partnership between English Heritage, the National Trust, The Highways Agency, Wiltshire Council, Salisbury Museum, Wiltshire Museum, Natural England and the Government within the framework provided by the Stonehenge World Heritage Site Management Plan 2009-2015. The project was largely funded by the Heritage Lottery Fund, commercial income and philanthropic donations. It has involved the delivery of improvements to the landscape setting of the Stonehenge monument (including the stopping up of the A344, the removal of the old visitor centre, car park and underpass), the Avenue and other attributes of OUV including the Cursus Barrows, together with a new, sensitively designed and environmentally sustainable visitor centre to provide a gateway to the Stones and the wider World Heritage Site (WHS). The new visitor centre was opened at Airman’s Corner in December 2013 and a new transport service now connects the visitor centre with the Stones which are 2km away for those who prefer not to walk. Visitors have the opportunity to engage with Stonehenge and the landscape through our state-of-the-state exhibition and external interpretation. The exhibition allows visitors to stand inside the stones and watch the seasons pass whilst taking a trip through time as part of an audio-visual 360 degree experience. In addition there are over 250 archaeological objects and treasures discovered in the landscape, on display together at Stonehenge for the first time. Ranging from jewellery, pottery and tools to ancient human remains, many of these items are on loan from our museum partners, Salisbury Museum and Wiltshire Museum. Another highlight of the exhibition is the face of a man who from near Stonehenge from 5,500 years ago – it is a forensic reconstruction based on his bones found near Stonehenge. 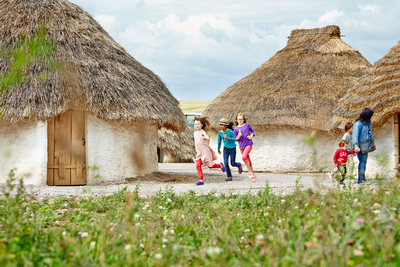 The visitor experience also includes a set of Neolithic houses which were built by a team of volunteers through experimental construction based on archaeological evidence found nearby. The houses tell the story (or what is known of it) of where people might have lived, what technologies they used, and the lives they led. 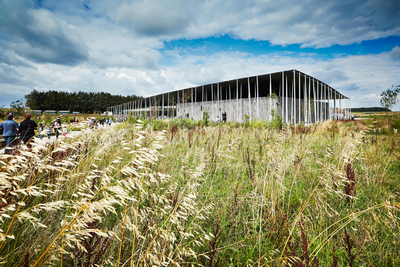 Visitors to the Stonehenge visitor centre are also encouraged to explore the north side of the WHS during their visit. Alongside the monument of Stonehenge itself English Heritage Trust also has Woodhenge and part of Durrington Walls in guardianship and the new interpretation at the visitor centre and in the immediate landscape shows the context of Stonehenge in a continuous ritual and economic landscape, with exceptional survival of prehistoric features of many types. Alongside our partners within the World Heritage Site we are committed to presenting Stonehenge as part of this unique wider landscape now clearly defined as having outstanding universal value as redefined by UNESCO in 2013. We have restored a sense of dignity to the setting of one of the world’s most loved ancient monuments.